It is amazing to me how the Internet can connect you to people you barely know who may be thousands of miles distant. But somehow those far away people and pictures on the screen can make big changes in the way you think about things and the way you live your life. Jim and Lisa are terrific writers and photographers (and exceptionally nice people) who have written extensively about the Great Loop. 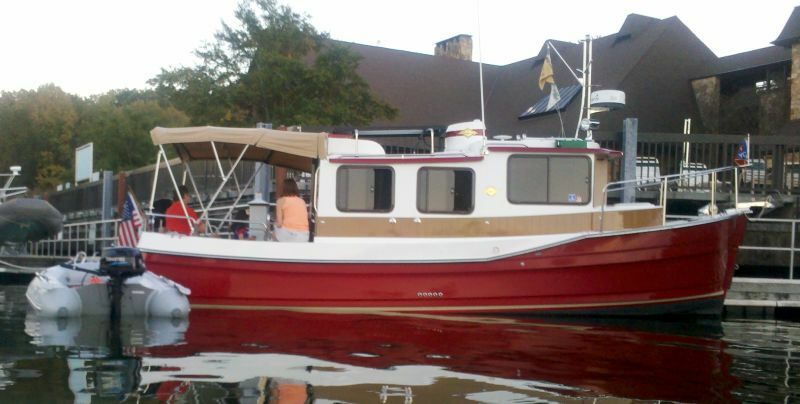 Their current Web site http://www.trailertrawlerlife.com has links to all their blogs and books. When I turned 50 in 2000 and started what is now called a bucket list, the Great Loop was right at the top. 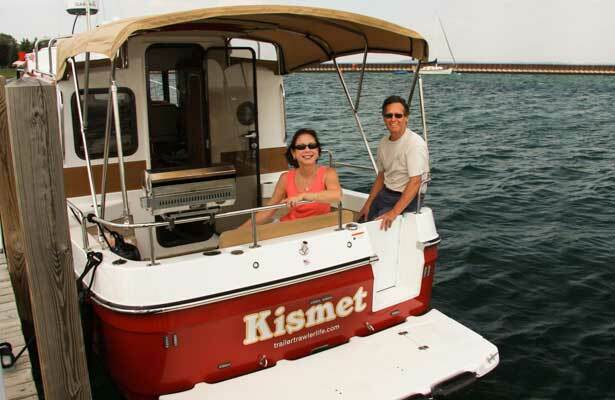 As time passed and I began researching seriously, I discovered the wonderfully chronicled voyages of Jim and Lisa in a series of yachts called Kismet. I joined the America’s Great Loop Cruisers Association and found many other blogs and web sites that convinced me that the Loop was very doable in our ancient teak motorsailer Memsahib. But the Favors and Rick and Betsy Johnson’s “Rick ‘n Roll” stories were the ones that really kept me mentally fueled to tackle and complete our wonderful voyage. 1) Because time is life’s most precious commodity, using the Interstates for the long stretches creates the time to enjoy more of the U.S. and Canada’s scenic gems. 2) Fuel is expensive and carbon emissions are wrecking the climate we boaters all enjoy. 20 miles per gallon makes a lot more economic sense than 20 gallons per mile in the kind of boat with any kind of get up and go and is simply more responsible. 3) I don’t want to force my family into a big-boat lifestyle that precludes other things they want to do — land travel, graduate school, and most-important to me, not working at anything other than building boats. 1) A trailerable boat is by no means palatial. It’s not home, it’s not living aboard, it’s comfortable camping. 2) You have to be cognizant of the weather and keep to the maxim that a schedule is a boater’s worst safety hazard. I would trust Memsahib in just about any weather short of a hurricane. This will be different. I really wrested with number 3, because I can’t back a trailer to save my life. I don’t want or need a big truck. But once again, I think the Internet has provided the answer. I read a series of articles by a fellow named George Sass. (I think he lives about 10 miles from here, but I’ve never met him!) He has a big, 26-foot, go-to-beat-hell C-Dory Tomcat and must be as bad a driver as me, because he has found that there are dozens if not hundreds of people with big trucks (and insurance) going all over who would love to make a buck towing your boat to a place with a nice big Travelift to take it off and put it in the water. My friend just had his 22-footer towed from Connecticut to Vero Beach by a great outfit for $1,400! So that’s the plan — to be executed as soon as I can build the dang boat!